Peru covers a large area of South America, stretching from the Pacific Ocean across lower ranges of hills and into the high Andes, where the source of the Amazon river is to be found. It's become a popular destination for walkers, looking for remains of the ancient Inca civilisation that thrived here before the Spanish arrived in 1531. Perhaps the best known hiking trail is the Classic Inca Trail to Machu Picchu, and this is the first Walking Story from Peru. Read all about it! The latest photos are from a trek in the Lares Valley organised by Bill Cook, including more from Machu Picchu. 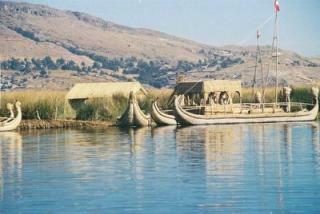 Lake Titicaca, lying between Peru and Bolivia, is the world's highest lake that large vessels can navigate at 3,810m. It is 190 km long and covers 8,300 square km. (Facts gleaned from a fascinating website page devoted to the lake). "It was taken from the edge of the Colca Valley, one of the deepest canyons in the world. It's a recognised viewpoint, spread over about a mile, and you wait with lots of other people and wonder if anything's going to happen, but all at once they start drifting up, huge numbers of them on the thermals. Once they get to the rim they start flying right past you, but it's pretty difficult to get a sharp photo. This is one of the males - the females are brown all over. You can just see the rocky edge at the bottom." 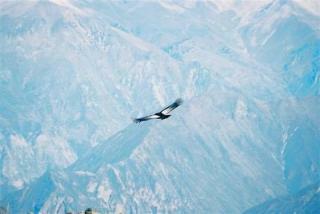 Read about a trek through the Colca Canyon in this story by Matt Carroll from the Observer of 14 September 2008. Great views but it's a narrow exposed track leading down into the canyon. At least there were llamas to carry the gear! And there's a linked video to give a better idea of the scenery. There's a fascinating story by Ethan Todras-Whitehall published in the New York Times on 3 June 2007 about "The Other Machu Picchu", the 20-mile trek to Choquequirao, another ancient religious site in the mountains which has far fewer visitors than Machu Picchu itself. The article highlights the need to manage the impact of large visitor numbers. We're hoping for many more contributions - if you've been to Peru, why not submit a story of your own?